Everyone Knows that NYC pizza is like no other. True NYC pizza crust is light, airy and crisp. The only way to make an authentic tasting NYC gluten free pizza is with NYC water. Mozzarelli's gluten free pizza - is the best gluten free pizza ! dishes using our delicious gluten free bread crumbs. Whether you Make Chicken Parmigiana or Mozzarella Sticks your dish will taste better with our gluten free bread crumbs. Gluten free cookies Have Never Tasted So Good. Enjoy gluten free cookies with milk, coffe, tea or anytime you need a special treat. Taste one of our gluten free cookies and find out what you have been missing. Mozzarelli's gluten free pizza was established in 2004 in Flatiron NYC, so that individuals on a gluten free and wheat free diet could enjoy authentic New York City gluten free pizza anywhere in the country. Our goal was to create a gluten free pizza that’s delicious for the whole family. We realize that when one individual is diagnosed with a wheat allergy such as Celiac disease, often times the household becomes wheat free. Creating the ultimate gluten free pizza crust was no easy task and the journey was long and tiresome but we believe once you taste our gluten free pizza crust you will become a believer that this is truely the best gluten free pizza you have ever tasted ! Mozzarelli's gluten free pizza company has developed an original New York tasting gluten free pizza crust, that is gluten and wheat free. While there are other gluten free pizza and gluten free pasta companies out there, only Mozzarelli's uses New York City water, which is known to give baked goods its amazing texture and flavor. The secret of authentic New York pizza dough has always been the water, a unique combination of minerals that gives the pizza crust a light, crispy texture that cannot be duplicated in anywhere in the country. The difficulty with making gluten free pizza is that you can’t use wheat flour or any flour that has gluten. Gluten is a protein that’s found in wheat and gives bread its classic elasticity and texture. In recent years, Celiac disease has been receiving a lot of attention from the media, as more and more people are diagnosed as celiac. It is estimated that 1 out of 133 people in the U.S. have Celiac disease, with a much greater percentage having a lesser wheat sensitivity. This means that there are millions of people in the U.S. and around the world that cannot eat wheat, and need a gluten free alternative. Mozzarellis gluten free pizza aims to provide individuals with a wheat intolerance a gluten free alternative that tastes like New York pizza, without the gluten. This is accomplished by using a unique combination of gluten free flours. New York water brings all the ingredients together and makes the pizza crust light and crispy, with exceptional flavor. There are several companies that currently produce gluten free pizza, but none of them come close to being an authentic New York pizza. Why Is Mozzarellis Gluten Free Pizza, Cookies & Bread Crumbs The Best ? 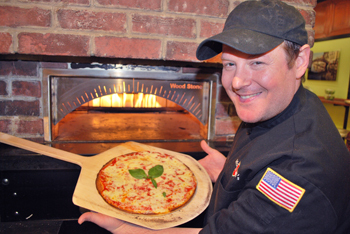 Mozzarellis has been serving delicious Gluten Free pizza, pasta, cakes and cookies since 2004. Our goal was to make a gluten free pizza that would truly taste like a NYC pizza parlor pizza. After years of trial and error and tweaking our recipe we have come up with the ultimate gluten free pizza that not only tastes like an authentic NYC pizza, but it’s light and crispy just like a true NYC pizza should be. Also our gluten free cookies, cakes, pasta and bread crumbs are best rated with all our customers. If your in Flatiron NYC, please visit our shop for a free sample. The Mozzarellis difference is a combination of precise ingredient measurements and skillful preparation by our executive chef. Just like baking a delicious loaf of artisan gluten free bread, to make a delicious gluten free pizza crust the dough needs to undergo slow fermentation to develop the flavors and achieve the proper consistency and texture.